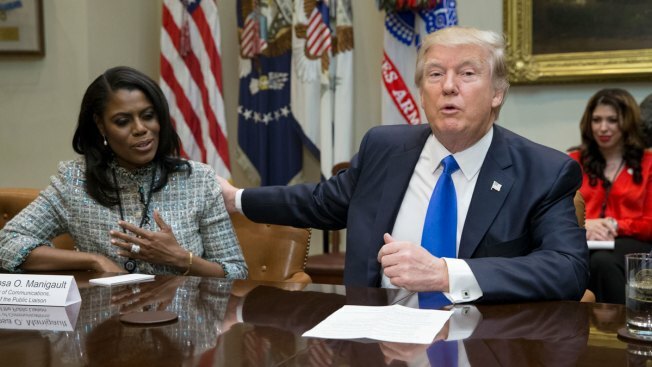 In this Feb. 1, 2017, file photo, President Donald Trump holds an African American History Month listening session attended by Director of Communications for the Office of Public Liaison Omarosa Manigault (L) and other officials in the Roosevelt Room of the White House in Washington, DC. Omarosa Manigault Newman once predicted that "every critic, every detractor will have to bow down to President Trump." The question now for the former White House aide and "Apprentice" contestant is whether that applies to her, too. Starring in another reality TV show after resigning from the West Wing, Manigault Newman unleashed one criticism after another of her longtime friend Donald Trump and former White House colleagues, testing the widely held view that few people are ever really exiled from Trump's orbit. Manigault Newman said she was "haunted" every day by Trump's tweets and "attacked" by colleagues when she tried to intervene. She said he tweets in his underwear in the early morning. She compared leaving the White House to being freed from a plantation, a reference to her one-time status as the only black member of the White House senior staff. If that wasn't enough, she said the country will not be OK under Trump, and teased that she may tell everything in a book. 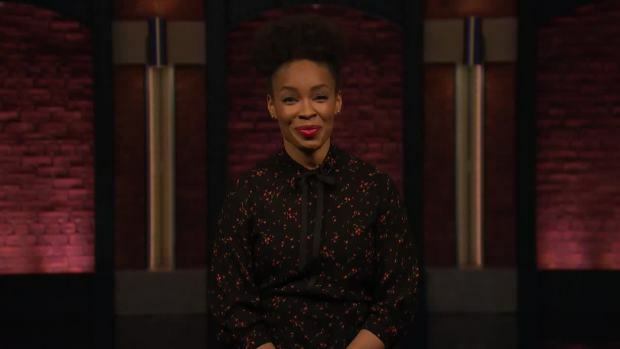 "Tonight Show" correspondent Amber Ruffin says "you're welcome" on behalf of black women for the Democratic win in Alabama's Senate race. She enthusiastically says black women not only got rid of Roy Moore, but they also got rid of Omarosa, "both in one night!" Trump, who called Manigault Newman a "good person" after she left the White House, referred to her as "the worst" in a speech at a press dinner where the president traditionally jabs at friends and foes alike. The White House dismisses Manigault Newman as someone Trump has now fired four times: thrice from "The Apprentice" and once from the White House last December. Armstrong Williams, a longtime friend of Manigault Newman, said the fact that Trump name-checked her in the Gridiron dinner speech this month "means she's on his mind." He doesn't think she had fallen out of favor because of her nationally broadcast criticisms. "Here's the key: The president has not tweeted about anything that Omarosa has done since she left. 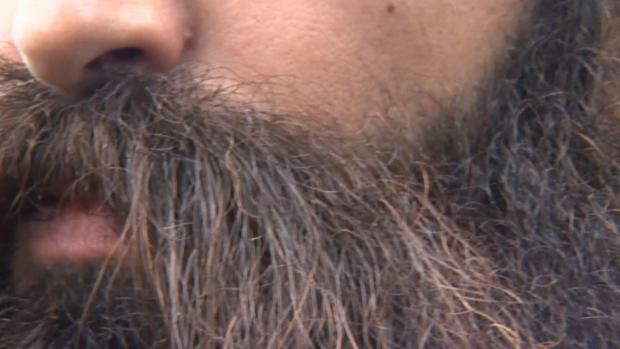 That's significant," said Williams, a conservative commentator. "He's tweeted about (Steve) Bannon and everybody else, but he has not tweeted or pushed back in any way against Omarosa." Bannon is the former White House chief strategist whom Trump publicly broke with after a book about Trump's first year in office quoted Bannon criticizing some of Trump's adult children. Trump then accused Bannon of "losing his mind." During her stint on CBS' "Celebrity Big Brother," where Manigault Newman and other celebrities lived under constant surveillance in a shared house until voted out, she steered clear of Trump's third rail, his family. But she let loose on the president and Vice President Mike Pence. In one whispered conversation, she said working for Trump was "like a call to duty," but "I was haunted by the tweets every single day, like 'What is he going to tweet next?'" When she tried to intervene, Manigault Newman said through tears, "all of the people around him attacked me." When asked if people should be worried, Manigault Newman nodded her head and said, "It is going to not be OK. It's not." She criticized Pence in a later episode, saying he'd be more extreme than Trump. "So everybody that's wishing for impeachment might want to reconsider their lives. We would be begging for days of Trump back if Pence became president," she said. "He's extreme. I'm Christian. I love Jesus. But he thinks Jesus tells him to say things. I'm like, 'Jesus ain't saying that.'" The conversations eventually came around to Trump's tweets. Manigault Newman was asked who monitors them. "He's up in his underwear or something at 4 in the morning. Who's going to monitor that?" she said. "Remember, the bad tweets happen between 4 and 6 in the morning. Ain't nobody up there but Melania" — Trump's wife. Manigault Newman then commented on the large diamond the first lady wears on her left ring finger and said Trump "can do whatever he wants. She ain't saying nothing." Manigualt Newman, who declined to comment for this story, passed up a chance to repeat her criticisms during a recent appearance on "The Late Show with Stephen Colbert" after the reality TV show ended. When asked if everything will be OK under Trump, she told Colbert, "You'll have to wait and see." She did tell Colbert that she plans to focus on her ministry. Last April, she married John Allen Newman, senior pastor at a Baptist church in Jacksonville, Florida, during a ceremony at Trump's hotel near the White House. The website of Mount Calvary Baptist Church says she was licensed to preach in 2011 and later ordained and served as assistant pastor. "My calling to the ministry is more important than anything else that I've done and I don't want to neglect it," Manigault Newman told Colbert. Whether that means she's done bashing Trump remains to be seen. In her first interview after leaving the White House, she told ABC's "Good Morning America" that "when I can tell my story, it is a profound story that I know the world will want to hear."